Iran to inform IAEA over its start of a process to increase the country’s uranium enrichment capacity, says spokesman. 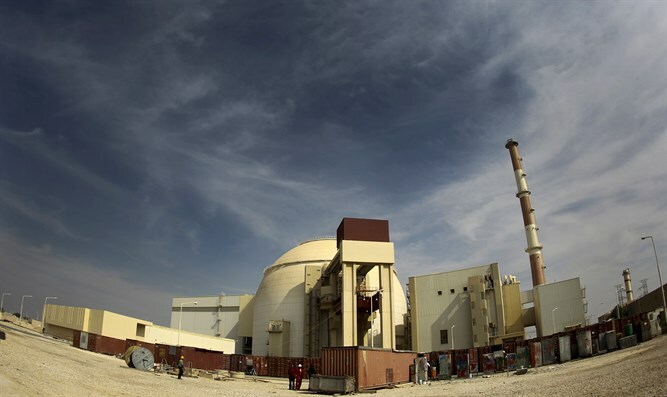 Iran intends to inform the UN nuclear watchdog in Vienna on Tuesday over its start of a process to increase the country’s uranium enrichment capacity, Iran’s Atomic Energy Organization spokesman Behrouz Kamalvandi said Monday night, according to the Reuters news agency. “In a letter that will be handed over to the International Atomic Energy Organization ... Iran will announce that the process of increasing the capacity to produce ... UF6 (uranium hexafluoride) ... will start on Tuesday,” Kamalvandi was quoted as having told Iran’s ISNA news agency. The announcement follows U.S. President Donald Trump withdrawal last month from the 2015 nuclear deal between Iran and world powers. A top adviser to Iran's Supreme Leader Ayatollah Ali Khamenei suggested last week that Iran could resume its uranium enrichment in the wake of the U.S. withdrawal from the deal. Kamalvandi’s announcement came hours after the head of the UN's nuclear watchdog called on Iran to ensure "timely and proactive cooperation" with inspections mandated under the 2015 deal with world powers over its nuclear program. While IAEA Director General Yukiya Amano said the agency had had access to all sites in Iran that it needed to visit and that "Iran was implementing its nuclear-related commitments", he also said that "in some cases, there existed room for Iran to provide us with more proactive and timely access, but such cases are not uncommon in safeguard implementation." The IAEA, which is in charge of making sure Iran is complying with the 2015 deal, has released several reports which showed that Iran was continuing to abide by the deal's key measures. Meanwhile on Monday, German Chancellor Angella Merkel stated that Iran's behavior was “worrying” during a joint press conference with Prime Minister Binyamin Netanyahu. “We agree that the question of Iran’s regional influence is worrying, especially for Israel’s security,” Merkel said. Netanyahu said that Iran seeks to extend its influence over the Middle East and to conquer Israel.